Take your time. It is the fastest way to achieve your goal. At the end of LEAD 365, many of you were given a bonsai tree. We gave you the tree to remind you that leadership takes ongoing care in order to flourish, much like the tree. But there are even more parallels to great leadership in the bonsai tree that I want to lay out for you today so that each time you look at that tree you can remember how important the small, daily choices you make are to shaping who you become as a leader. Let’s start with a brief intro to bonsai. Bonsai trees are regular trees, not dwarfs. They stay small because of how they are cared for over time. If you took your bonsai tree out of its pot and planted it in your back yard, it would soon grow much larger. They take on interesting shapes because the trunks and branches are very intentionally pruned and wired. Bonsai trees require special soil, and precise watering and fertilizing. It takes science, art, and a great deal of patience to take an average tree and make it into something special like a bonsai. Here’s how I see the intersection with great leadership: Just like growing a bonsai tree, becoming a great leader takes time, patience, and great intention. You need to prune out behaviors that get in the way of being a person worth following—kind of like pruning away the branches that are unhealthy or unpleasing in a bonsai. You need to push yourself past your comfort zone to keep growing—kind of like wiring the tree to encourage it to grow into the shape you want. 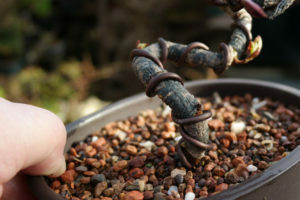 If you wire a branch too aggressively it will break; too lightly and you won’t get the shape you want. You need to apply a healthy amount of pressure to get the growth you want and end up with something special. You need a great deal of patience and grace for yourself—and others—to become a great leader. You will fail, and sometimes those failures are incredibly painful. But even those failures shape and grow you. Some of the most beautiful bonsai are grown from dead, scarred wood. And finally, you have a choice. You can put the work into becoming a person worth following with the small decisions you make each day. You can wrestle with shaping the culture of your team and not tolerating behaviors that make that culture drift away from what you want it to be. You can struggle to make the time to create vision of where you and your team are going and then communicate that in a way that aligns your team to that vision. You can give honest feedback and dig into yourself to make real, deep change. It’s exhausting. So what about you? Do you want to do the normal thing and lead because of your position, but without much intention (be a tree planted in the backyard)? Or are you willing to put in the time and effort every day to become something rare and valuable—a truly great leader. A person worth following who creates clarity around purpose, vision, and values; who builds a great team; who gives and receives feedback freely; who shapes culture, understands how to make money in business, listens well, and on and on. I hope that you think of this when you next see your bonsai (or the empty pot where it once lived for those without a green thumb). The daily choices we make might seem insignificant at the time. But these daily choices, over time, make us who we are. Who do you want to be? Image by bethcoll. Used under CC by 2.0 license.